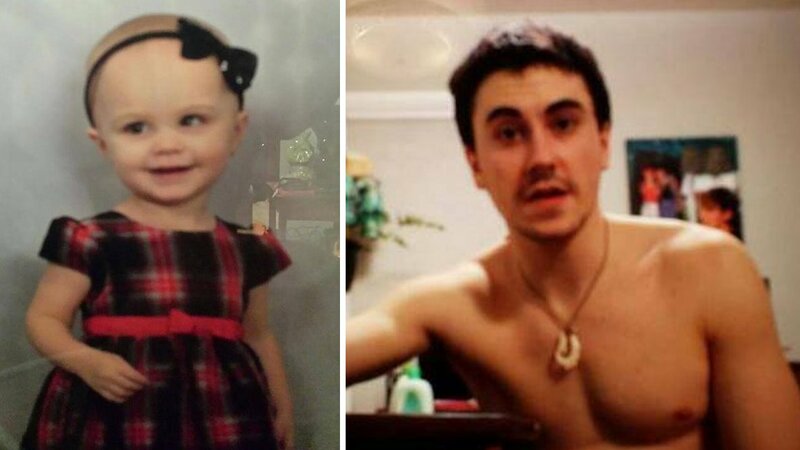 SYRACUSE, New York -- A toddler who disappeared over the weekend was found dead in a harbor on Tuesday, and her father, who had been picked up a day earlier wearing a disguise, was charged with her murder, police said. An emergency call late Saturday night from the mother of 21-month-old Maddox Lawrence led to an Amber Alert and a search for her, Syracuse police Chief Frank Fowler said. Maddox was believed to have been with her father, Ryan Lawrence. Maddox's mother, Morgan Lawrence, told police that Ryan Lawrence was supposed to pick her up from her job at the Destiny USA shopping mall but instead left the car and keys for her in a parking lot. When the mother returned home, she said, she found a message from him that indicated he might harm Maddox and himself. She called police, touching off Sunday's Amber Alert, a massive search and pleas for tips from the public. On Monday, police got a call from a thrift shop employee who recognized Ryan Lawrence when he went into the shop in Baldwinsville, 10 miles northwest of Syracuse, authorities said. Police found Lawrence walking on a nearby street, wearing a disguise, and took him into custody, they said. "The person making that phone call was instrumental in bringing this case to where we are today," Fowler said Tuesday. After interviewing Lawrence, police focused their search for Maddox on Syracuse's Inner Harbor, an inlet off the end of Onondaga Lake. State police divers found her body underwater along the Creekwalk, a biking and hiking pathway. Investigators were awaiting the results of DNA testing but were confident the body was Maddox's, Fowler said. Lawrence was sent to the Onondaga County jail to await arraignment Wednesday morning on second-degree murder charges, Fowler said. He couldn't be reached for comment by telephone in jail, and police said they didn't know if he had a lawyer who could comment for him. Fowler said the investigation into Maddox's disappearance and death was continuing, and few details were released. "This is a tough one on all of us," he said.